Do you remember nuts at Christmas back when we grew up? 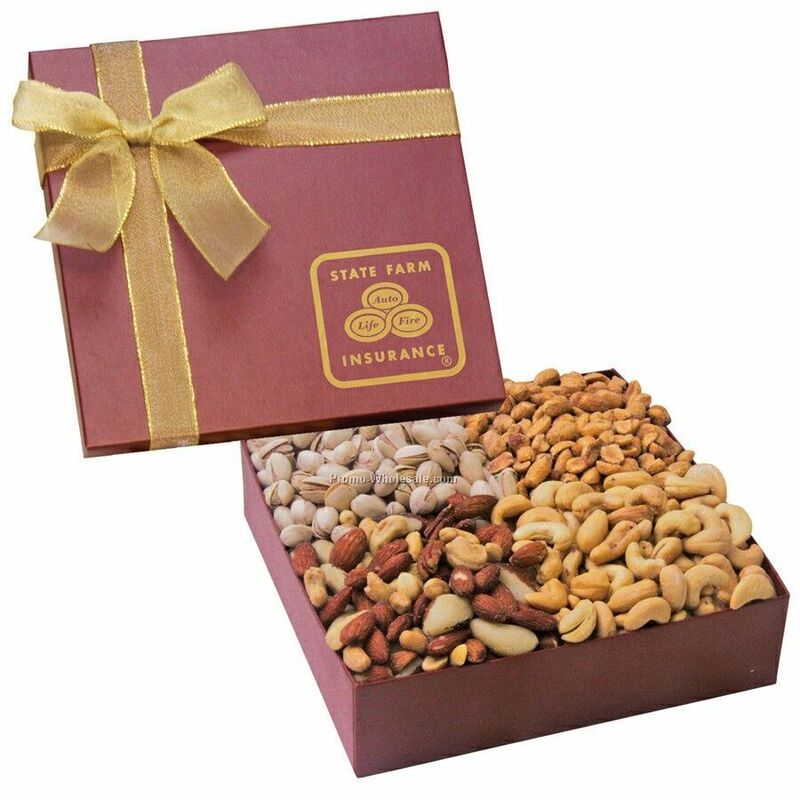 These days there are bowls of nuts all over at Christmas gatherings. 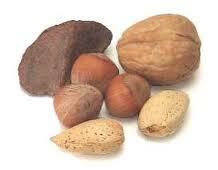 You can get nuts of all kinds with all types of flavorings. You can get pre-packaged sets of 6 or 8 sampler cans… flavors range from sweet to sour, from spicy to cheesy. 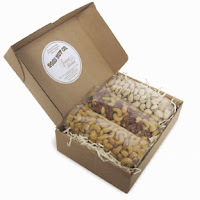 Nuts range from just peanuts to all mixed nuts to macadamia to other exotic nuts. Wasn’t so when I grew up. 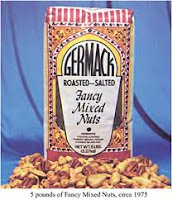 Not only did we not have many nuts or much variety, they were expensive so we didn’t seem to have a lot of them. The one thing I remember that we had a lot of that you just don’t see as much today is unshelled nuts. 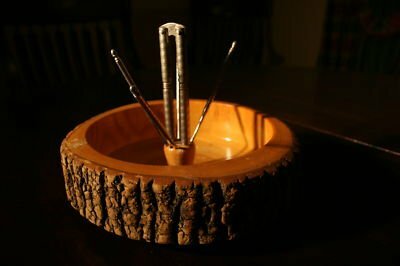 We had a big wood bowl that looked like a hollowed out piece of wood that would be filled with nuts. It is exactly like the picture of this one here. They must have been popular! There was a little metal nutcracker that we would use to crack the nuts. There were also little metal pick things to get the meat of the nut out of the shell. I remember that it was a real challenge to squeeze tight enough to break the shell without destroying the nut inside. It also wasn't uncommon to pinch your fingers in them a few times. You don't see many of these around today - it certainly made you appreciate the nuts when you had to really work for them. 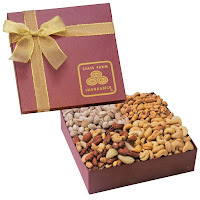 Any of you have the same nutty experiences growing up? Ok – I am the only one who thinks this? 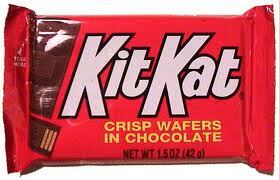 You know the old jingle: “Gimmie a break, gimmie a break, break me off a piece of that Kit Kat bar” When was the last time you heard it sung in a Kit Kat commercial? Seriously – how long has it been? I scoured the internet and saw videos that were definitely from the ‘80s – maybe the ‘90s. But that’s the newest commercial I could find with the words sung. And – I can’t even remember the last time I actually saw a commercial with the words in it. So – this leads me to the question that I’d like to ask the kids of today: Do they have any idea that the snap-snap-snapping of the chocolate bars in the commercials today are playing out the words of the Kit Kat song? I would guess that they don’t! If you watch the commercial and imagine that you don’t know the song, it all seems very confusing. I’m just saying that the guys on Madison Avenue need to rethink their approach to it all. The song is not so memorable that it’s transcended the time and generation gap. Remember when they were in foil? 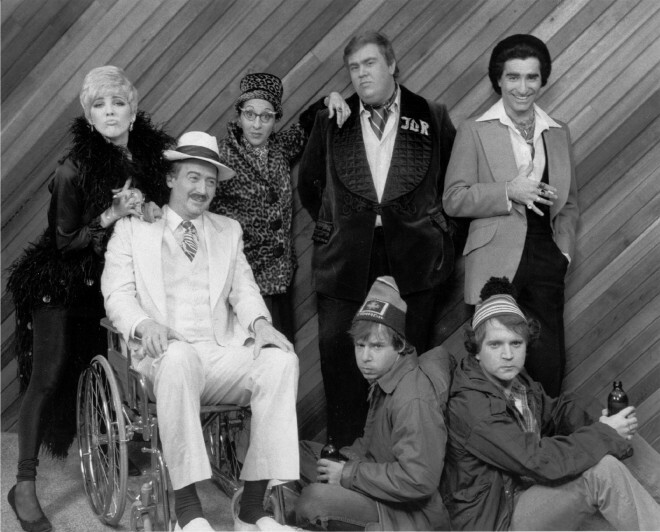 There was a great comedy show that was on in the '70s. My brother and I loved this show and would laugh until we just about died. 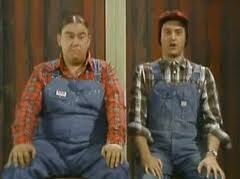 We loved to recite the skits all the time and still crack each other up today with the same lines. If you guessed SNL back when Blushi, Ackroyd, Curtain, Chase, etc. were on and it was good - well, that would be a good guess! But - not right. 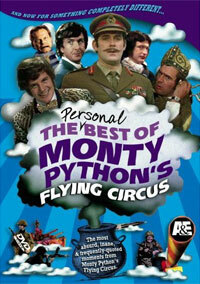 Or - if you guessed Monty Python and the Flying Circus, that would also be a great guess. BTW - I got the entire set of CD's of all the episodes of that for a birthday awhile back - THAT was a great gift! But, no - that also isn't right. No - I'm talking about a great little show that came out of Canada... SCTV (Second City TV). It was comedy concept show about the programs and behind-the-scenes shenanigans of a cheesy, low-budget TV station. It starred John Candy, Eugene Levy, Joe Flaherty, Andrea Martin, Rick Moranis, Catherine O'Hara, Harold Ramis, Martin Short and Dave Thomas. It was incredibly funny and very off-the-wall. They just had canned audience laughter which just added to the uniqueness of it. Check out this video... Their take on Perry Como getting a little too relaxed in his performances. Anyway - it was a great show with a kind of cult following at the time. 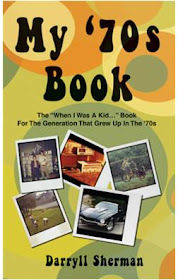 I highly recommend it - there are Youtube videos to watch and boxed sets that you can buy on the web. If you're looking for a Christmas gift for someone who like the show, they're not too expensive! It may be an acquired taste, but I think it's Great stuff! 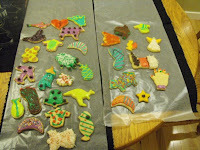 There's just something about Christmas Cookies! There are so many great kinds of cookies at Christmas, and my mom made some of the best! Some of her best were shortbread, lemon bars, spritz and some that were called bars by the fire. My sibs and I started a tradition when we were young kids. 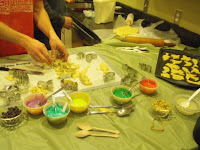 With mom's help, we started making our own Christmas cookies. We made a big double or quadruple batch of sugar cookie dough. Then we would roll it out and use cookie cutters to cut out dozens of different shapes. Oh – we had lots of normal Christmas shapes: Santas, reindeer, candy canes, angels, Christmas trees and all the other traditional icons. 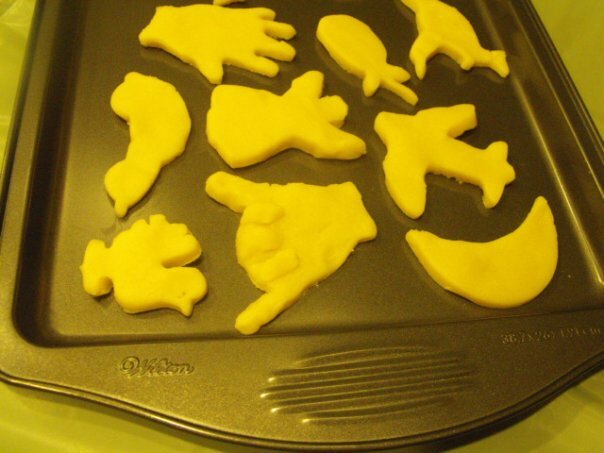 We ALSO had things like sharks, cars, a cowboy boot, giraffes, flip flops, hearts, hands, airplane, a pineapple, ducks, kangaroos, cows, and whole bunch more – a pretty funny wide assortment of odd things. 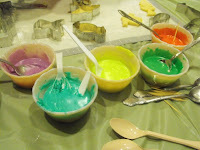 We would then make up a bunch of bowls of different colored icing and little bowls of nuts, chocolate chips, all sorts of sprinkles,and a ton of different types of toppings. And then the fun would begin. 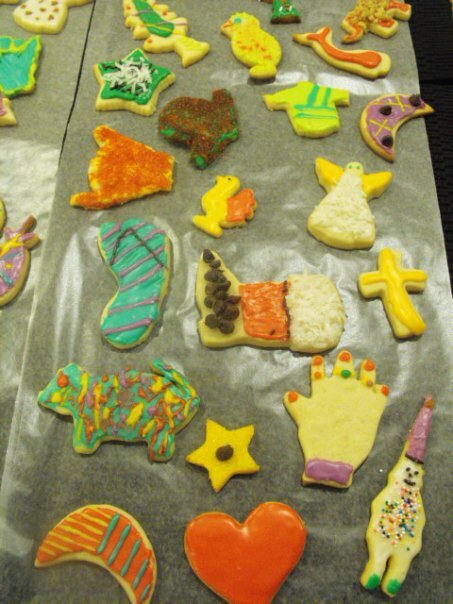 We would spend hours baking and decorating the cookies. 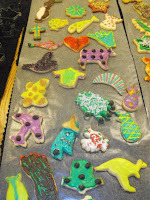 They weren’t especially delicious, but we had a lot of fun making them. It was an entire evening of laughing, singing along with Christmas songs, making cookies and generally having a good time with family members. We have continued this for all these years. I’ve included a bunch of pics from one of our most recent times. These days, there are spouses, kids and nieces and nephews, but we always make time for it. It’s as much a part of our Christmas celebration as all the “normal” stuff. Although - if you look at some of the cookies, you'll see there's few of them that are not very normal and reflect the late hour at which we were finishing up the decorating. 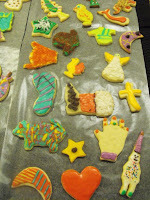 You can click on the pics to enlarge them and see all our fun shapes! What fun and unique traditions does your family do for the holidays?